If you have a dimmer switch in your house, chances are that you are pretty confused about the new compact fluorescent or L.E.D. light bulbs and how they relate to dimmers. Let's take a look at a couple of things that you should be looking for beginning with the light bulbs.Light Bulbs: First of all, all of the incandescent and halogen light bulbs are dimmable. That's not the case with compact fluorescent or LED bulbs. The compact fluorescent and LED bulbs need to say "Dimmable" on the packaging. Usually the word "Dimmable" is quite prominent on the packaging in a red field. Putting a regular compact fluorescent bulb on a dimmer makes it blink on and off. When the dimmer is on the lowest setting it will blink slowly. When it's set to the brightest setting it will blink really fast. It'll blink so fast that you can't tell it's blinking when you walk into the room but you'll notice it blinking as soon as you go to read something. Dimmer: Not only do you need to make sure that you get a dimmable light bulb but you also need to get a dimmer compatible with compact fluorescent bulbs and LED bulbs. A regular dimmer used with compact fluorescent or LED's will hum just slightly. A dimmer that is compatible with compact fluorescent and LEDs will also work for incandescent and halogen bulbs. The key to dimmers and dimmable bulbs is to look at the labeling. 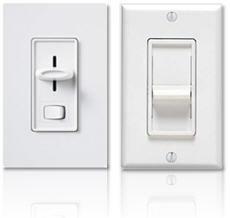 Following the labels on both dimmers and bulbs will save you a lot of time and trouble after installation. Installation, by the way, is the same as it has always been. That's one thing that hasn't changed.